MARVEL’s Thor: Ragnarok is officially Hulk-smashing the box office it’s SO good! Have you seen it yet? If not, you can check out our review with our top 7 reasons you should see the movie!! We loved it (I’ve now seen twice already)! Thanks to the #ThorRagnarokEvent Premiere Press Trip, I received some fun Thor products that are perfect gift ideas for your kids (or your favorite MARVEL fan). Even though my my boys haven’t seen the movie, they are obsessed with the characters and LOVE these toys I brought home!!! 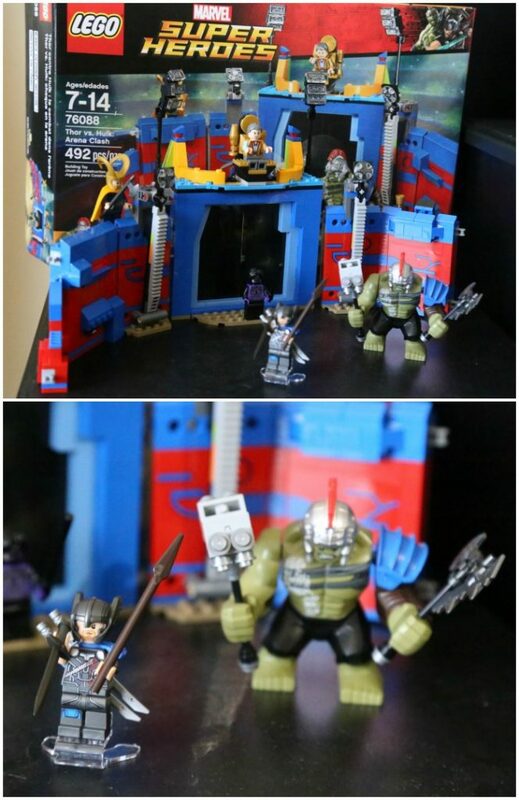 So, if your kids are anything like mine, they’d probably love Thor: Ragnarok items for holiday or birthday gifts – the non-kid Thor fans will probably love some of these products too! 😉 So, I’ve rounded up some great gift ideas for you. And, with the popularity of the movie, I’m sure we’re going to be seeing a lot more items come out soon! So, check out our Thor: Ragnarok gift guide below (affiliate links are included). Thor Ultimate Mjolnir Hammer – Summon the power of Thor with this Ultimate Mjolnir Hammer that features voice and sound effects. Inspired by Marvel’s Thor: Ragnarok, the hard foam head lets your little hero strike (in preapproved places, of course) and save the world! 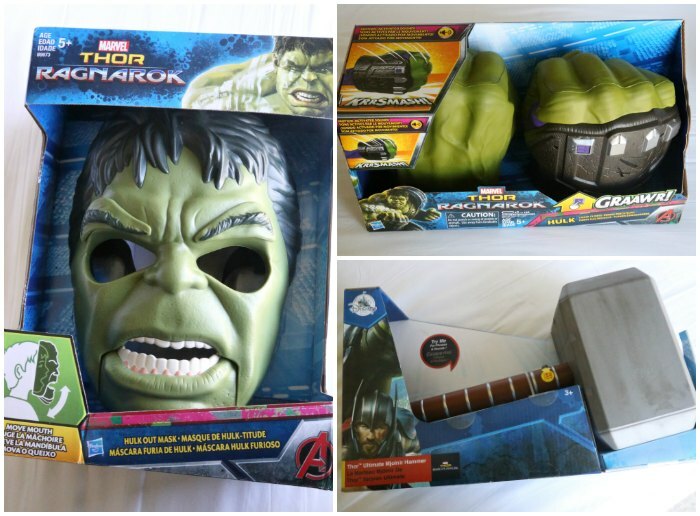 Hulk Mask by Hasbro – Your little hero can Hulk out with this deluxe mask featuring Marvel’s Incredible Avenger. Opening your mouth activates a chin lever than opens Hulk’s mouth and moves his eyebrows, too! Hulk Smash Fists by Hasbro – Get ready for super smashing action with these Hulk Smash Fists. Featuring heroic sound effects inspired by Thor: Ragnarok, these giant green gloves really pack a punch at playtime. “Marvel’s THOR: RAGNAROK: The Junior Novel” book – Thor’s world is about to explode in this exciting junior novel based on the upcoming film Marvel’s Thor: Ragnarok. His devious brother, Loki has taken over his home of Asgard, the powerful and ancient Hela has emerged with dark designs, and Thor is imprisoned on the other side of the universe. To escape and save his home, Thor must compete in an alien contest of champions, fighting his way to freedom against none other than his former ally and fellow Avenger… the Incredible Hulk! Features an 8-page color insert! Funko Pop Characters – who doesn’t love a cute character? I have Hulk on my desk and love it! Thor: Ragnarok Hot Wheels – my boys LOVE the themed Hot Wheels! A perfect stocking stuffer! 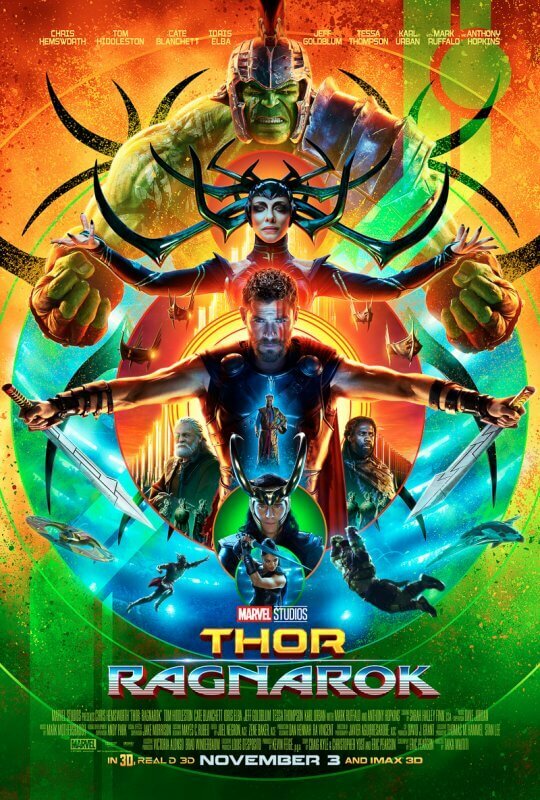 Thor: Ragnarok Sound Track – the sound track for this movie is SO good!!!! So, this would definitely be a great one for fans! So fun! There definitely are all kinds of great Thor gift ideas and I’m sure we’ll see even more as the holidays approach. If you haven’t seen the movie already, be sure to make plans to go see it!